Congratulations on graduating from college! This is a huge milestone in your life, but now that the cap and gown are returned, you’re suddenly faced with the reality of your situation. No more dorms. No more lectures. It’s time to venture into the real world and join the ranks of the working. Finding a job straight out of college can definitely be a challenge, though, and one way to minimize that potential struggle is by considering remote positions as well. Perhaps you’ve never seriously considered the possibility of telecommuting, but there are some distinct benefits—especially for recent college graduates. Let’s take a look at some of those perks along with places where you can look for your first remote job. Everyone’s heard of the starving college student, but the same can be said of the recent college grad. Money is bound to be tight during this time, and one big benefit of remote work is that it can save you money. First of all, there’s the commute to consider. You don’t have to expend money for gas, daily wear and tear to your car, more frequent oil changes, parking, or alternate forms of transport (such as bus, subway, or train). Without a daily commute, you might not be driving that often, and you could possibly even get away with changing your car insurance to a low-mileage discount. All these small monthly savings can add up quickly—at a time when the extra money is really beneficial. Not having to invest in an office wardrobe. Not having to pay out for pricey dry cleaning or laundering of office wears. Not being tempted to splurge on daily coffees or lunch outings. Tax breaks, including home office deductions. In addition to the dollars and cents saved through remote work, there are also some highly significant, albeit more intangible, savings. One big example of this has to do with your health. Many remote workers find that being able to set their own hours, avoid traffic and commuting, and have more hours in the day to themselves directly leads to less stress. While this isn’t going to be the case for every remote worker, many do experience diminished stress and better overall health (physical and mental). At the very least, working remotely gives you a better opportunity to make sleep a priority, and that can help stave off small (and big) illnesses. Also, rather than dragging yourself into the office and potentially prolonging that nagging cough, you can take a sick day when you need it because you have the freedom to adjust your hours and make up that lost time. When allowed to consistently be a part of your life, stress can be a pernicious and destructive force. It can negatively affect your health in myriad ways, which can even lead to more doctor visits and more medical bills. As a recent graduate entering the workforce, you’re going to get a crash course in trying to find that perfect work-life balance. This is hard for just about every worker and something many people struggle with, but as a young professional, you’re all the more likely to want extra hours in the day to socialize, explore your city, and have fun. Working remotely can eliminate your daily commute time. Depending on where you live—how crowded it is, how much traffic you’d need to battle, and how effective your mass transit is—this can save you several hours a day. That means your eight-hour workday is actually eight hours, not nine or ten or even eleven. This leaves you with more time for yourself. That’s time you can spend exercising at the gym, socializing with your friends, catching up on sleep, or just relaxing. Finding the right work-life balance is an ongoing challenge for many workers, and it can be particularly difficult for young people experiencing that struggle for the first time. Remote work is one possible way to make that transition from college life to work life a little easier. Noisy coworkers. Distracting office gossip. Seemingly endless meetings. All these things can seriously sidetrack you from getting your work done. Recent grads who are new to the office environment can find it difficult to be productive amid all these potential stumbling blocks. Working from home effectively eliminates many of these distractions and often leads to increased overall productivity. That can help establish you in the eyes of your employer as a dedicated, reliable, productive member of the team. Young professionals who have recently graduated from college are increasingly likely to be aware of their carbon impact on the environment and want to actively work to reduce that. Working remotely is one simple way new workforce members can decrease that impact. Without the daily miles from commuting, remote workers find they often drive far less than their in-office counterparts. This limits their gas consumption, as well as emissions from their cars. For many people, graduation marks the first time they are experiencing the real freedoms of adulthood. Even if you lived away from home during college, you still had the structure of school to organize your life around. Without that, you are truly free to explore new options, and the years following graduation are a great time to do that. Want to try living in another city, state, or country? All of a sudden, that possibility could actually become a reality. That’s one of the most exciting aspects of working remotely. For many of these positions, as long as you have a computer and Internet access, you can work just about anywhere. For some, that simply means being able to customize a home office. For others, it means having a way to subsidize travel or make living abroad a reality. Recent college grads shouldn’t limit themselves in any way. It’s an exciting time of potential and opportunity, and more people are catching on to the idea that success doesn’t have to come in the form of a nine-to-five desk job directly out of college. Remote work might seem a bit unconventional, but it’s a plausible way to earn good money without sacrificing other potential opportunities that come your way. When you start a new job, you’re always bound to have lots of questions. This is entirely natural and to be expected. When you’re working remotely, however, you don’t have the luxury of popping down to your manager’s office to get guidance or assistance. That can feel a bit scary, but working remotely helps teach you to become a problem solver. You learn to be more proactive and to start actively seeking solutions to your problems, without the guiding hand of anyone else. In any good remote position, your manager should never be more than an e-mail or phone call away, so if you really need help, it should be available to you. But you’ll quickly learn how to sort out the small stuff yourself, whether that’s through a quick Google search or a scan of the company’s policies. Developing these attributes early in your career can be invaluable. They’re the kind of skills that will make you an asset at not just your current position but any subsequent job you take as well. Without the sink-or-swim mentality of a remote position, these kinds of qualities can be more difficult to foster in an onsite position. Recent college grads are often big on enthusiasm but small on professional experience, and that can make landing a job hard. This reveals perhaps one of the biggest benefits of opting for remote work straight out of college. You are not hemmed in or limited by your small geographic area. Rather than considering only the handful of companies within a reasonable distance from your home, you can literally apply to jobs around the globe. When getting a job is often a numbers game—the more jobs you apply to, the more likely you are to get that positive phone call back—checking out your remote options opens a huge amount of potential doors. Also, if you live in a small town or a particularly rural location with lower-than-average salaries, working remotely allows you to get paid a wage that’s more globally commensurate with the work. For example, say you’re a web designer living in Mississippi. If you worked an in-office job, you’d obviously be getting a salary that’s consistent with that kind of work in Mississippi. However, if you did the exact same job but remote, you’d be getting paid a wage that’s consistent with the company’s home base, which could be a state with a much higher median wage. This allows you to live where you want to live while getting access to the potentially higher living wage of a different location. As a young professional, this allows you to stay near family and friends and the rest of your support network, which can provide an important emotional safety net as you make this transition from school to work. Remember, no job is permanent! Remote work isn’t for everyone. Some people find it isolating and lonely; others struggle with the self-discipline necessary to make it successful. However, it’s important to remember that taking a remote position doesn’t mean you’re tying yourself to remote work forever. Because it offers so many benefits—especially for recent graduates—it’s worth just giving it a try. If you find it’s not a good fit for your working style, that’s OK. Maybe you can transition to an in-office position at your current company. Maybe you can work remotely part of the time, enjoying the freedom of offsite work and the benefits of relationship building with your coworkers. Or maybe you’ll need to find a new job altogether. However it ends up working out, at least trying remote work lets you know if this working approach is right for you, and it also provides some nice perks as you’re just getting your feet wet in the working world. Remote work is also more common and respected now than ever. There’s no lingering stigma around a virtual position, so your time as a remote employee will certainly not be construed as an unexplained gap in your résumé. On the contrary, many employers often view remote workers as disciplined, productive self-starters, so even if it’s not ultimately the right choice for you, it can still be a credit to your professional credentials. For people who have never considered remote work before, the prospect of finding these jobs can be daunting. While people often feel prepared and knowledgeable about how to find in-office jobs, everything can get a bit hazier when it comes to offsite jobs. It doesn’t have to, though! Whether you’re looking for remote or onsite work, many of the same principles still apply. You just need to know where to look and where to advertise yourself. Every year, as companies catch on to the potential benefits of remote employees, more and more of these positions become available. 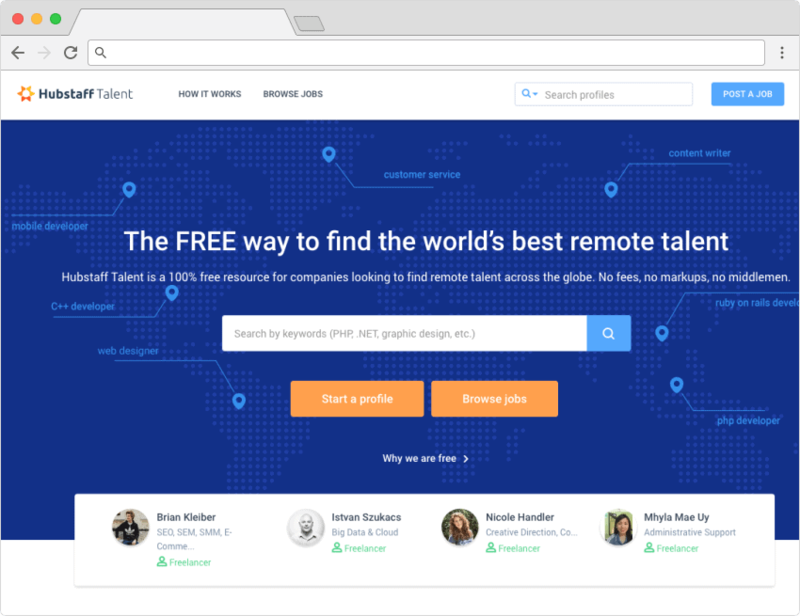 Even on “standard” job sites, such as Indeed, you can specifically search for remote positions. Hubstaff Talent Hubstaff Talent is a fully legitimate option for finding online work, with the added bonus that its services are completely free for both job seekers and employers. You can create a profile where you can present your portfolio and experience, plus note your availability and rates. You won’t need to waste time on bidding for projects, as employers interested in your skills can contact you directly or you can apply for available positions posted on the site. We Work Remotely Another solid option for finding good online gigs is We Work Remotely. The platform was founded by the authors of the book Remote, Jason Fried and David Heinemeier Hansson, and they sure know what they’re talking about. Job seekers don’t need to create profiles to be a part of the board. They can just check in regularly to see the new job offerings, which are split into different sections such as Programming, Marketing, and others. FlexJobs FlexJobs is a proven player on the scene. The website has been around since 2007 and has helped a ton of people find the flexible job they need. Job seekers have to pay a monthly fee to get access, but the website guarantees diverse options and a legitimate service. It also offers in-depth research and employee reviews on the companies that post jobs, so you can be sure you’re signing up for a good deal. Smashing Jobs Guess what! Smashing Magazine has its own job board. Smashing Jobs doesn’t offer a ton of job ads, but they’re all very well selected. Creative professionals can choose from design and programming ads, and they can be either full-time or freelance. Only employers need to pay to post a job listing, so it’s free for you. Authentic Jobs As the name suggests, Authentic Jobs is truly one of the reliable online working sites around. It’s been approved by The New York Times, after all. The job board does not require your registration, so you can just pop in and browse through the listings from top companies around the globe. From programming and design to management and sales, there’s a job offer for every creative soul. Genuine Jobs Genuine Jobs is a job board that offers opportunities beyond the tech and startup scene, but still boasts plenty of marketing and programming jobs. The service is free for job seekers. The site even urges people to report job offers that have an application fee. Freelance Writing Gigs If you’re a copywriter or content marketing writer, Freelance Writing Gigs is the website for you. Besides the job board where you can find a long list of different writing gigs, the platform hosts a blog with a ton of useful information and a resource center on the topic. You don’t need to sign up or pay, so you can jump straight to the job offers and see what’s in there for you. DesignCrowd The next legit website in our list is DesignCrowd. Its services are free for freelance designers. You can browse the posted jobs and immediately see the pay rates and deadlines. There are plenty of logo design projects, but you can also find web design jobs and other types of visual projects. Topcoder For developers and web designers, Topcoder is a solid opportunity for finding gigs. The website is branded as a crowd-sourcing platform, so employers entrust their development projects to online teams. To start using the website, you need to register for free to start exploring the available projects. Taskr Taskr is an Indian freelance platform that allows job seekers to post the tasks that they can perform together with their payment requirements. From graphic design to programming, all types of freelancers use the website to post their services and expertise. The Mom Project The Mom Project allows moms to find rewarding, flexible opportunities with world-class companies through their digital marketplace. Once you complete a profile on their platform for free, you can be connected with a range of opportunities to include everything from full-time gigs to maternity leave coverage. Power to Fly This company’s focus is to get more women into the tech industry. They offer remote as well as onsite positions. Sign up is free and once you create a profile, if a job match comes up, they will notify you. Remote work isn’t going to be the perfect fit for every worker. Some people thrive on the water cooler breaks and the face-to-face interactions that mark an office job. However, if you’re a recent graduate and you’re taking stock of all your work-related options, consider the benefits remote work can provide. Again, you don’t have to commit to virtual work forever, but it might be a positive way to gain some experience and make this first transition into the dynamics of the professional working world. Do you have any advice for the next generation of remote workers? Let us know below! Thanks to poor communication, an unclear vision, and last-minute client demands, your remote agency missed the project deadline and went over-budget. Not good—but not the end of the world. Except on the next project, thanks to poor communication, an unclear vision, and last-minute client demands, your team missed its deadline and blew the budget again….